Classic Lights has all kinds of lights for home decor, starting from hanging lanterns and chandeliers to wall lights for your office. 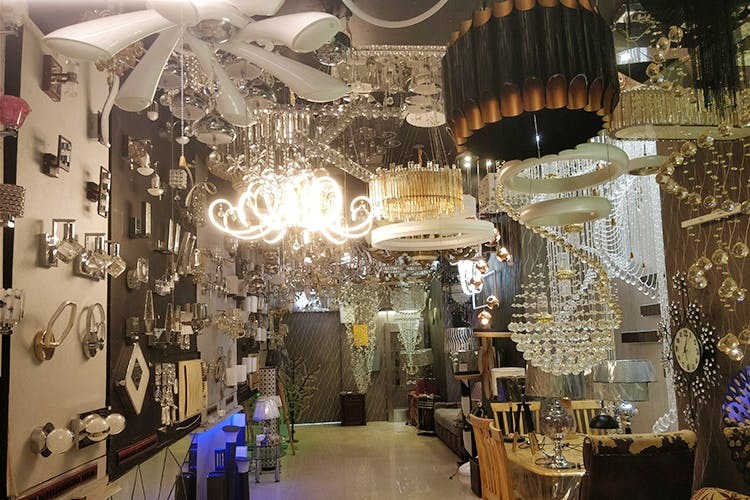 Their collection is incredible and they are all one-of-a-kind and hard to find in other lights stores in the city. Really want those cute fairy lights to twirl around your bed, or the ones inside glass bottles? You can find those and a hundred others at Classic Lights! This store been around in the city since 1986 and is popular for the variety. They have office lights, ceiling lights, wall lights, lanterns, street lights, chandeliers, stand-alone lamps, and even a traffic light! The starting price is INR 500, and it gets more expensive if its LED-based. The fancy chandeliers start from INR 10,000. Some of the high-end lights are so intricately designed and are made of glass, you will forget how expensive it is when the lights come on! They even have Jute-based lamps and tiny hanging lights to decorate bedrooms. So, next time you’re in Anna Salai, walk into their store and check out their lights. Even if you don’t buy anything, it’ll be worth it. Don’t forget to check out the first floor. It’s literally a room literally filled with elegant and classy lights, and when all the lights come on, it looks like a dream. We saw it and didn’t want to leave!